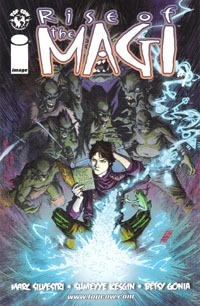 Rise of the Magi is one of the Free Comic Book Day comics that seemed to jump out more than most…though at present whether that was internet “hype” or the logo and cover of the issue itself catching me, I’m not sure. I hadn’t gotten around to reading that issue, but saw the first issue of the series itself out this past week, so decided to give it a chance. (While not the $2.99 that anymore is a quick-sell for me, the 0-issue having been free and this first issue being $3.50 at least kept it under the frustrating $3.99 price point). 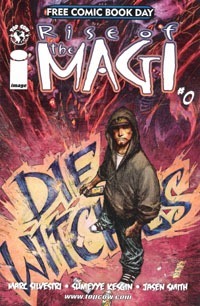 The 0-issue’s cover was a bit deceptive…I can’t quite put my finger on it, but it led me to believe the main character was going to have some sort of agenda against witches (and warlocks?) or otherwise be opposed to magic/etc. in general. However, the issue begins with a page of mostly text setting up the situation–all magic is contained in a small orb, and doing something to the orb would affect the entire universe. A boy whose brother is part of some sort of guard unit protecting the orb stumbles across a situation threatening the orb, leading into the #1 issue. In Rise of the Magi #1, we get some further context of the magic orb, the Spellguard, and what’s going on that threatens the orb. As the threatening scenario plays out, the boy is drawn tightly into the situation, and ultimately thrust into a world he’s going to have to learn to operate in as the series moves forward. Visually, I was more impressed with the first issue–brief as it was. The second issue had a bit of a jarring visual shift, though at least it came with a “chapter break” in the story rather than just shifting with no apparent rhyme or reason. Given this is not an “established property,” I have no visuals to compare it to–simply the archetypal fantasy setting given the primarily-fantasy setting of the story. That lack of comparison leaves the art to stand on its own, with no preconceived notions on my part with the specific characters. Given I’ve liked Silvestri‘s art in the past on X-Men stuff in particular, I had rather high expectations for this, but found myself a bit disappointed. The art was not bad, it just didn’t live up to whatever my expectations had set. Story-wise, I found myself rather “iffy” partway into #1, figuring this to be “just another” fantasy thing, but the ending of the issue gave a bit of a twist to that…yet, it’s a twist that also feels like “just another” of its kind. The characters and specifics may be a bit different, but it’s definitely not the first such story I’ve seen/read of its kind, and I’m not entirely sure what to make of it. I can’t say I’m exactly “impressed,” but to again use the passive: it’s not bad. If you like Silvestri or any of the other creators involved, it’s definitely worth taking a look. All in all, I think it’s safe to say that if I happen to notice the next issue I’ll pick it up, giving the series another issue to really hook me, but it doesn’t yet have me enough to want to put it on my pull list. This story reminds of me how much I tend to enjoy the Atomic Robo FCBD editions. As far as I can tell, this is a new/original story. Robo and Dr. Dinosaur team up to stop some Time/Space disaster, but the evil doctor has other schemes…which don’t exactly work out according to his plans, leading to everyone truly having to team up in order to save the day. The writing’s solid, and the art is good. Unlike many, many other comics…this just simply is. It’s Atomic Robo, and for me, that’s all it needs to be. The story and art are what I know of the character, so it’s like simply checking out a random episode of some tv show and NOT finding a new group of actors or something different than I’m used to. 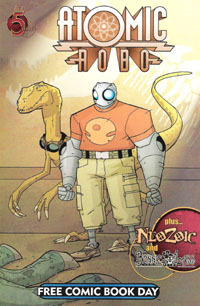 I’ve been reading these Atomic Robo FCBD issues for years now, but unfortunately it has yet to translate to me buying any of the single issues (due to pricing) or any of the collected volumes (again, pricing). But I do think I’m closer than before to biting the bullet and buying a collected volume, even if the price of the entire library of Atomic Robo seems overwhelming at present. If nothing else, this was a welcome story in a stack of FCBD stuff, and made it to my “initial reads” stack, and this is absolutely a key issue well worth being a specific FCBD comic to seek out. It’s honestly been years since I’ve seen the movie this is based on. The characters look familiar, but other than Mike and SUlley, I couldn’t remember any of the names of any of the other characters. Still, I wanted to give it a shot, given it’s a first issue, I recalled enjoying the movie, and of course, I wanted to support a new comic from a smaller publisher with a $2.99 price tag. 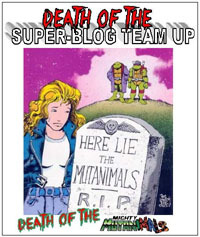 The issue’s story is not all that deep–it basically reintroduces readers to the status quo left at the end of the film–that this company that used to generate power for the monster city with the sound of Earth-childrens’ fear has converted to gathering laughter as a power source instead–having discovered laughter to be far more efficient than fear. We witness the trappings of the film–the monsters in this plant using portals to reach Earth kids from their closets, and inspiring laughter which is sent back to the plant and harnessed for power. The issue’s conflict comes from some monsters finding their props coming up missing, and then they’re found in Mike’s locker, though he claims he didn’t take them. Sulley–who has risen to the foreman position in charge of things is put in an awkward spot as others leap to conclusions, putting words into his mouth, etc. And of course, even Randall is back to cause trouble. The story’s not terribly complex or deep, but it moves along at a quick pace. We do get a full story here, with the ending fitting things well, and no “to be continued” to be found (instead, we’re given a small text box reading “The End.” signifying this specific story’s concluded). The art’s not bad, and definitely captures the primary visuals of the characters. As this is a 2-D comic and the movie was CGI…there’s plenty of differences stylistically. I’m quite satisfied, though, with the way the characters appear–they’re quite recognizeable, and there’s plenty in the way of facial expressions that really add depth to the characters that simple words wouldn’t. I think kids who enjoyed the movie will enjoy this–even adults ought to be mildly entertained by it. Having enjoyed the film when it was out and hving fond memories attached regarding who I saw it with, this was a nice bit of nostalgia. 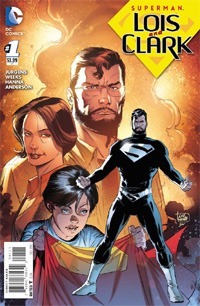 I see no reason not to pick up the next issue, but at the same time there’s not an ongoing story prompting me to follow into the next issue for the story’s continuation.